I think it is important to acknowledge that travelling can be very intimidating and sometimes kind of scary. I like getting out of my comfort zone, but at the same time there is a reason why it’s called a “comfort” zone! Before every trip I have ever taken I always have at least a tinge of anxiety… Will I like this place? What if I get sick? Am I going to have any fun? And so on and so on… so often we think about the worst-case scenario. I think this is normal; we just need to be able to realize when we might be being a bit silly and overcome these fears. I remember friends “confessing” they were nervous about going somewhere, like it was some something to be ashamed of… Are you kidding me… when I went to Egypt I was so nervous, South East Asia I thought for sure I was going to have a horrible time, even my first all inclusive I remember worrying I would be bored silly (all these trips were amazing!!). Once I acknowledged my worries or concerns, I always try and think about all the positive things that might happen! It won’t be long now until we are off for a two week vacation to France with little Miss. H. Am I nervous… YUP! Do I occasionally find myself thinking, “what have I committed myself to! !” maybe for a few seconds, then I remember I LOVE THIS! Could it be very challenging with a time change and a different culture… sure! Will we survive… absolutely and have some amazing stories to tell, no matter what! So much of travelling is about your mind set… if you let your fears and anxieties take over you are most likely going to have a horrible time, but if you acknowledge these things and then move on you are going to be in a much better state to accept the awesome things a trip can offer you. Having a positive attitude will always win over a negative one! Now that we are travelling with a little person I think our mindset is even more important than ever… these little munchkins pick up on a lot more than we give them credit for! If mom and dad are stressed do you really think the kiddo isn’t going to be stressed? Even in everyday life how many time have we seen a kid fall, look around, notice no one is looking and carry on playing or OR the opposite… kid falls, adult comes rushing over and the child pauses, realizes they should be frighten, and loses it! Obviously there are exceptions to this given example, but generally if we have a positive attitude kids will reflect this, if we are worries, stressed, scared, whatever… kids reflect this! I will leave you with two of my favorite quotes that I think apply to my general travel philosophy…. I get a little nervous when I travel some where that I have not been before. It happens more for me when I am traveling without my husband. I took a car trip last week with just my son to meet some friends and the GPS took me in the wrong direction. It was very stressful but we eventually made it and had a good time. Wow good for you! Sounds like you probably have some stories… Thanks for the encouragement! We have a trip coming up next month and when I first booked it, I was anxious about whether or not it was the right time to be taking a trip. Now that we’re in the middle of dealing with a family tragedy, my husband and I are both looking at the trip as a distraction from real life and can’t wait until we depart. So often there are reasons not to travel… But something those reasons not also be the reasons to! I hope that you have a lovely break and come back refreshed and ready for life’s challenges! Excellent and timely post! 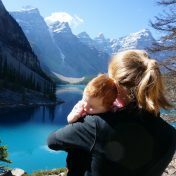 I’m prepping right now for a solo overseas trip and haven’t been overseas by myself – I’ve always been with my husband and/or kids! Am I excited? You bet! Am I nervous? Absolutely! But the little ones do pick up on our emotions and my kids are old enough that I feel like it’s okay and good to share with them that it’s perfectly normal and good to be both nervous and over-the-moon excited. Great post! Thank you so much for your kind words! I have taken many solo trips and the nerves and excitement often meld together! Have a wonderful time! So true – you really have to overcome the nerves about what could go wrong and embrace the new place you’re about to discover 🙂 Enjoy France!